One of the things that I enjoy about being a tech reviewer is that I often get to try out the most unique of products. The Circuit Scribe Maker Kit is definitely one of those items that is difficult to describe, but it could change a generation. The closest thing that I could come up with is one of those circuit/science kits. I remember that my sister had this thing that had all kinds of projects, and you would wire things to other things, and yeah, I’m just not doing a good job of this. Perhaps this is a better intro: the Circuit Scribe is made for Makers. Yes, I actually think this is the first time that I talked about Maker culture on this website, and it usually gets grouped with words like STEM and ways of learning about Science, Technology, Engineering, and Mathematics by doing and building. You can build a lot with this Maker Kit. 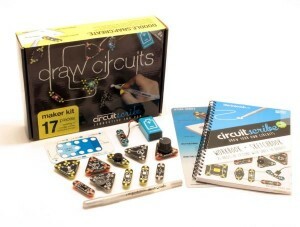 The purpose the Maker Kit from Circuit Scribe is to teach kids (and adults) about building circuits. What is interesting is how you build them, it’s not like there is a green board or something. Instead, all you need is some paper and these modules. Oh yes, you will also need a pen. This pen has some kind of ink that allows it to conduct electricity. There are about eleven modules and a 9 volt battery, and you can use the pen’s ink to connect them together. You can learn a lot about LED lights, Switches, Transistors, and Resistance. If you don’t know what those are, and how those apply to electronics, this Maker Kit is for you. Yes, you can make a lot with this, and it is quite versatile with a buzzer, blinker, and all sorts of things. If you want to learn as you build, head on over to the Circuit Scribe site and lay down about $79.99 on the Maker Kit. You should also check out what is available on the Circuit Scribe site and learn a lot more.